Transportation Costs > How Much Does Hangar Space Cost? How Much Does Hangar Space Cost? If you can’t build or a buy a hangar of your own, renting one may be an option to consider. How much does renting a hangar cost? On average, the price of renting a hangar will cost anywhere from $100 to more $400+ a month. It’s going to come down to the size of the hangar, the time you rent it, the airport you rent from, as well as the geographical location. For instance, a hangar that has no amenities, such as water, electricity, concrete or heat, can cost $50 to $300 a month, while space as large as 1,000 to 1,600 square feet with concrete flooring can cost $350 to $600 a month. Most hobby flyers report paying less than $250 per month for their hangar space. 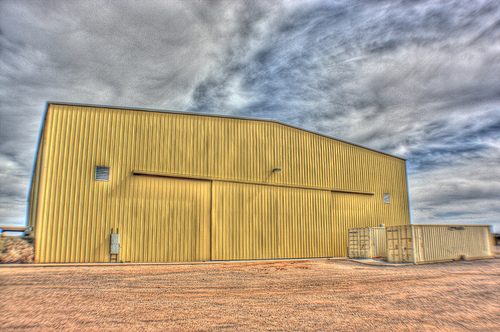 Corporate hangars, which can measure up to 100’ x 100’, can cost upwards of $1,500 to $3,000 per month. Corporate hangars will have amenities such as an attached restroom with showers, insulation with climate control and epoxy flooring. For a daily rental, a single aircraft hangar can be leased for about $75 to $200 a day, while the entire hangar can be rented for $200 to $400 per day. Members on Supercub.org noted they paid anywhere from $150 per month in California to as much as $600 for a land lease. According to avweb.com, t-hangars can hover in the $125 to $600 range, or if you wanted to purchase one, it would be $10,000 to $40,000, depending on the size and the location. The quotes mentioned above should include an office area, lounge and the usage of the airport’s runway. 24/7 security and/or surveillance, depending on the airport, should be included as well. Higher-end hangers may include utilities such as water and electricity. There are two common types of hangars: a single plane hangar and a t-shaped. A t-shaped hanger will be shaped like a t and it will be designed in a way to fit your airplane’s body. It will be narrow in the back for the plane’s tail and wide enough in the front to accommodate the wings. These will be cheaper to buy and will require less involvement; however, owners have claimed space is limited. A single plane hangar, which can often be referred to as a shared hangar, will be more affordable since you will have to share the space with other owners. Hangar space can either be enclosed in a private locked garage with electric/non-electric doors or it can be similar to a carport where the airplane can be parked outside, either shaded or non-shaded. Some space can include multiple airplanes and you will have to share your space with other owners. Higher-end units will have a concrete floor, electric doors and some sort of climate control, while lower-end hangars will have a dirt floor and won’t be fully enclosed. Heated hangars, often found in colder climates, can cost much more due to the utility costs. Owners who have had heated hangers 24/7 can cost upwards of $400 to $1,300 per month. Late fees, up to 10 percent, may apply if the bill isn’t paid on time. Liability insurance may or may not be included in your quote. If it isn’t, this can be an additional $150 to $250 per year, depending on the insurance company. premieraircraftsales.netweave.us warns you that if you were to choose a shared hangar space, you risk the chance of potential “hangar rash,” a term used when minor accidents happen to your aircraft while it’s being hangared. This can include negligent when maintaining their own aircraft or a poorly run storage facility. Depending on your geographical area, some airports have waiting lists as long as 10 years. Before you assume there’s an opening, you may want to call the airport for more information and add your name to the waiting list, even if you don’t think you’re going to rent space within the next few months. HangarTrader.com is a simple hangar space search engine that allows you to find hangar space for sale and/or rent in your area. Prepaying your bill in advance may lead to a discounted bill. Check Craigslist to find non-conventional storage options. For example, some farmers may be able to house your airplane for a lower fee. While a hangar will protect your airplane from the elements, tie downs can be as little as $50 per month at some airports. However, if you do go this route, your airplane will be exposed, just like a parking spot would be at a local grocery store.